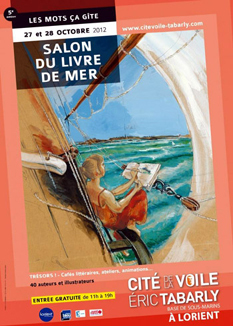 The Cité de la Voile Éric Tabarly organized on Saturday 27 and Sunday 28 October 2012, the fifth edition of its Sea Books Exhibition named « Les mots ça gîte ». The appointment brought together about forty authors, illustrators and explorers around the theme of treasures related to the sea, whether engulfed, maritime, literary, artistic, heritage and even culinary treasures ! 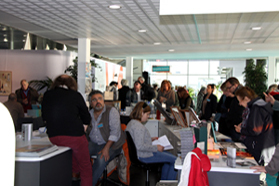 Like every year, many interesting animations were offered to curious visitors came swarming : round tables, Arts coffees, debates, workshops, documentaries, exhibitions, etc. (right panorama : courtesy of and copyright to Auteurs de vues - F.Henry). Around the table were gathered Emmanuelle Levasseur, a well known underwater journalist (Trésors – Glénat Ed.) ; Francis Le Guen, essential personality from the world of diving and audiovisual (Narcoses – Glénat Ed.) ; Jean-Louis Maurette, L'Expédition Scyllias founder (Les gardiens du silence and Epaves en baie de Lorient – Keltia Graphic Ed.) ; and the explorer Eric Surcouf, great-nephew of the famous corsair from Saint-Malo (Trésors terrestres et sous-marins - Arthaud Ed.). The animation was led by Pol Corvez, lecturer in Linguistics and Semiotics of Images at the University of Angers, specialized in maritime lexicography and writer who, through his thoughtful intercessions, allowed to animate a fascinating debate that never failed to call favorable an attentive audience. 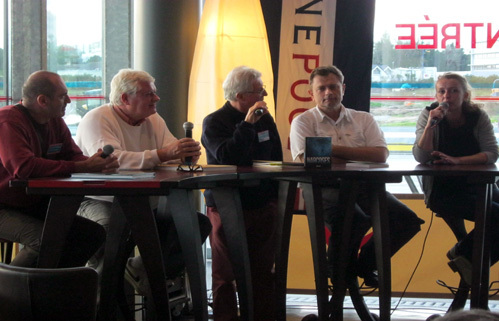 L'Expédition Scyllias team for this event : Vincent Gautron, Jacques Hellec and Jean-Louis Maurette. A good job for the fifth edition of this appointment in Lorient which has become within a few years an event of great quality where maritime enthusiasts can meet, exchange and dream walking on the aisles and animations. 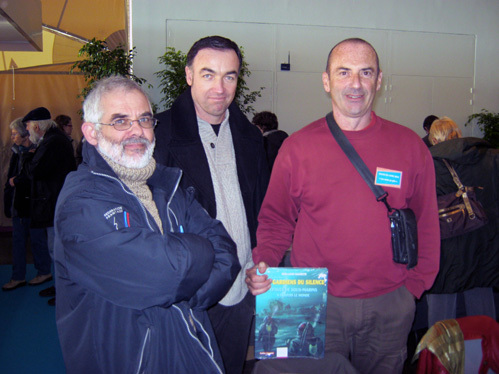 Left : Jean-Louis, Eric Surcouf and Pol Corvez. 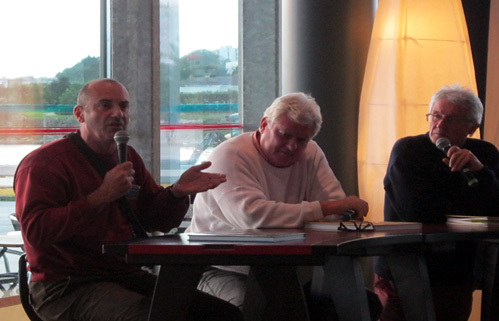 Right : Jean-Louis, Eric Surcouf, Pol Corvez and Francis Le Guen are carefully listening to Emmanuelle Levasseur.